Watershed restoration at Rotary Glen Park is underway! 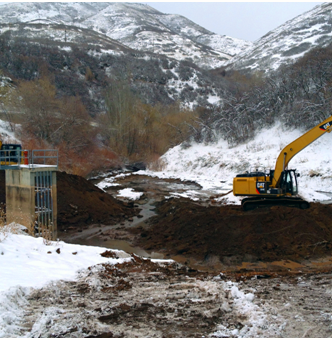 Emigration Creek is one of the many tributaries of the Jordan River and the home to the Bonneville cutthroat trout (which is on Utah’s sensitive species list). The quality of its water is critical to help maintain a healthy watershed for people, fish and other wildlife. In 2002, Emigration Creek was declared an impaired waterway due to high levels of the bacteria E. coli. Bacteria levels are highest in the summer months due to waste from park visitors’ canine companions and warmer temperatures. Improve water quality by installing a fence along the southeast edge of the pond to keep dogs and people out of the creek. Enhance habitat—which is critical for migratory and native bird species—by replacing Siberian elms with native foliage like cottonwood trees. Address public safety and stabilize the hill with slope grading and new vegetation planting. Fun Restoration Fact: What is the benefit of planting vegetation along the water’s edge? Vegetation creates a buffer for people and dogs, keeps the water in the creek cool by shading, and filters bacteria from runoff. Come springtime Rotary Glen Park will once again be a safe urban sanctuary for you to picnic, bring your dogs (their poop bags, too), and enjoy nature. Here’s a recent photo of the work that is underway. If you are like us, you might be wondering why the workers are filling the pond behind the dam with dirt. We asked a County employee, who explained that in order for the heavy equipment to access the other side of the creek, workers have to first move the dirt to create a platform for the backhoe and then grade the slope. Can’t wait to see the project when it’s done!